Chicago is an incredible city. From its impressive skyline and the rich history and culture to the friendly people, amazing food and beaches along Lake Michigan, Chicago has it all. The problem is, when we are hard at work for our Chicago seo clients, we tend to overlook some of the greatest features it has to offer. To help you rediscover your city, below is a list of the top 5 things to do in Chicago. Chicago is well known for its rich cultural heritage, and there’s no better place to experience this than at the Chicago Cultural Center. While it easily gets overlooked due to the nearby flashy shopping paradise, the Cultural Center boasts the world famous Tiffany dome, elegant pieces of handcrafted décor and a host of exhibitions and performances. It’s an awesome experience spending a day appreciating your city’s rich cultural heritage. Are you a jazz lover? Do you enjoy poetry? The Green Mill cocktail lounge is the perfect place to spend a Sunday evening, sipping on some refined wine and listening to amazing Jazz music or enjoying the great poetry slams. The fact that the Green Mill was opened in 1907 and has connections to the Chicago mob scene adds to the allure of this place. Ever imagine what your city was like back in the 1920s? You can experience this by treating yourself to a tour of this historic hotel, which was built back in 1929. It still retains all the glitz and glamour from the 1020s, from high ceilings with crystal chandeliers to aged wood carvings. There are even statues of knights in shining armor. Whether you are a guest or non-guest, you can explore the past with a self-guided iPod tour of the hotel. Looking for a fun way to relax on a sunny afternoon? Hook up with friends and head out to the Playpen for a boat party. Enjoy an afternoon of fun and music while getting a great view of Chicago’s impressive skyline. Ever wondered what your city looks like from above? You can satisfy your curiosity by climbing up the Willis Tower and look down on the city from the Skydeck, which sits 1353 feet above the city. The Skydeck, which is open every day of the week will give you a new perspective of your city. 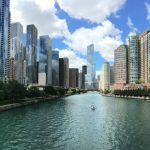 We have been growing our presence in Chicago – and wanted to do a little city feature for our chicago seo clients. A little light-hearted look at what to eat and what to do in the city. This is the first in that series. Not every major North American city can boast the same culinary identity that Chicago can. Sure, Los Angeles may have some of the best Mexican in the country (or even in the world for that matter) but that owes more to the large Norteño population in the city of Angels than anything else. You may find great Salmon in Seattle, but the same goes for Vancouver and Portland so you can’t really call the tasty pink fish (that’s arguably best-cooked papillote style) the rainy city’s own. If there is one metropolis that does have its very own cuisine it’s Chicago. Here are four mouth-watering local favorites that the city of Mike Ditka and Muddy Waters does so well. Pizza’s been around in the United States ever since Italian immigrants started arriving in the 19th century. It exploded in popularity in the late 1940s after Americans who had served in the Italian campaign in the second world war returned home with an appetite for what for them must’ve been an exciting foreign delicacy. Thus, Pizza became even more American than apple pie, with plenty of regional varieties—in Detroit they bake a square that’s topped off with plenty of pepperoni and mushrooms, a New York slice is famously foldable, and if you order a tomato pie in Philadelphia you’re going to get a bready crust topped with bright red gravy and parmesan. Then, of course, there is the world famous deep dish Chicago style pizza. What makes Chicago’s pizza completely unique is the way it’s cooked. In New York, they toss their dough, but in Chicago, they put it all together in a cast iron skillet before firing it in the oven. What’s more, the ingredients are layered, and these can be any ingredients you want, but if you want to keep it old school you’re going to want to go with some Polish sausage for the bottom layer. As for the best pizzeria in the windy city, that title probably goes to Bartoli’s on Addison St. In addition to their deep dish pies, Bartoli’s are also famous for their waffle fries. When it comes to fast food in Chicago, hot dog stands outnumber all of the McDonalds, Burger Kings, and wendy’s combined. In fact, there are nearly 2,000 hot dog vendors in the area, and a great deal of them sell the classic Chicago hot dog. Whereas Chicago pizza is defined by the way its cooked, the Chicago hot dog is all about the ingredients. For starters, an authentic Chicago dog is an all beef wiener, never pork. The Chicago style hot dog was invented by the Jewish proprietors of Fluky’s back in the late 1920s, and the all beef hot dog was originally all about staying kosher. These days, Vienna Beef and Red Hot Chicago are the most popular local brands. As for the toppings, you’ve got to have diced white onions, sweet relish, a dill pickle spear, yellow mustard, sport peppers, and a sprinkling of celery salt (the often overlooked secret ingredient). For Chicagoans, ketchup on a hot dog is borderline sacrilegious. Starting from these basics, different hot dog spots all over Chicago put their own twist on the classic, with popular options being the cheese dog at Portillo’s and the Asian inspired egg noodle covered dog at Belly Shack. At most places you can get your dog either boiled or grilled, in which case it’s called a char dog. Many vendors also offer a Maxwell Street Polish, where a Polish sausage takes the place of the all-beef wiener. Hand cut french fries cooked in duck fat are also a popular side dish and at the local favorite Gene & Jude’s they come piled right on top of the hot dog. Although it hasn’t quite become the worldwide phenomenon that the Chicago style hot dog and deep dish pizza have, this inexpressibly delicious sandwich is as quintessentially Chicago as watching the Blackhawks in a bar with a faded “Heileman’s Old Style” beer sign hanging outside. The sandwich’s roots go back to the turn of the century and the communities of Italian immigrants who settled on the South side of the city where the stockyards used to be. The Italian beef sandwich Chicagoans know and love today was perfected by a butcher named Pasquale Scala who perfected the process of slow roasting beef above a pan filled with a tasty spiced stock the locals call “juice”, then slicing the roast beef paper thin and stuffing it all into a crispy white bun along with fried peppers and giardiniera (an Italian relish that is often used as a condiment with unique Chicago food). Anyone visiting Chicago for the first time needs to try a local hot dog and go out for deep dish Pizza, but there is a lot more to unique Chicago food, and an Italian Beef sandwich ought to be on any traveling foodie’s checklist. Popcorn was invented in Chicago. The first wheeled machine that popped corn in oil was unveiled to the public by its inventor G.H Cretors for the first time in 1893 at the Chicago Columbian Exposition. Interestingly, other now commonplace goodies that made their debut at this world’s fair included Juicy Fruit chewing gum and Pabst Blue Ribbon beer. Just like Pizza, the hot dog, and the beef sandwich, over time Chicago also put its own spin on popcorn. Cheddar popcorn is found all over, as is caramel corn, but in Chicago, they like to mix the cheddar and caramel corn together for a uniquely delicious blend of salty and sweet. The G.H Cretors company is still a popular high-end popcorn brand today, and its take on Chicago mix is one of its flagship products.